“There will be ‘maximum punishment’ [assassination] for those who disturb the ‘freedom’ that we gave to Tamil people by shedding our blood,” say posters and notices distributed by helmet-wearing unknown operatives who entered the premises of the University of Jaffna Thursday. The poster, titled “last warning” and issued in the name of “Naam Ilangkaiyar Security Force” (We Sri Lankans Security Force), names 8 students from 4 districts and 3 lectures of the University of Jaffna. The elected leadership of the student union this year and the newly elected leaders for the coming year are named in the list. One of the students is Mr. S.Thavapalasingham who was recently attacked by a group of men believed to be SL military intelligence operatives and one of the lecturers is Mr. S. Raveendran, who was abducted in Colombo in March 2009 and released after two weeks. While the 8 student activists and three lecturers are named and threatened, allegedly by SL military intelligence, civil society leaders who voice for Tamil rights are being ‘advised’ via third party sources by the SL military establishment on their political activism. The posters by ‘We Sri Lankans Security Force’ have evoked fear among the students of the university as students were abducted or killed in the past following such warnings. 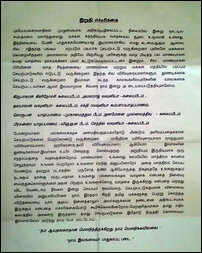 The posters were seen at several places on the walls inside the premises of Jaffna University in the morning. Later, a group of unknown persons, who came in motorbikes, put up the same posters on the wall of the student hostel, according to hostel guards. The men were all wearing black helmets. Besides Geography Department lecturer Mr. Raveendran, who is the brother of former parliamentarian S. Kajendren, the poster also names Mr. Vigneswaran, also an Arts Faculty lecturer and the incumbent secretary of the University Teachers Union, and Mr. Hariharan, a former student leader and now an assistant lecturer. The poster says that these lecturers are promoting “separatism”. The names of student activists of the Jaffna University Student Union appear in bold in the poster. Kirupaharan from Ki'linochchi district (Arts Faculty), Amalraj from Vavuniyaa (Arts Faculty), Thavapalan from Vavuniyaa (Arts Faculty), Sakthi from Jaffna (Vavuniyaa Campus), Soroopan from Jaffna (Faculty of Management Studies and Commerce), Janamenon from Mullaiththeevu district (Arts Faculty), Prasanna from Jaffna district (Science Faculty) and Senthil from Vavuniyaa (Arts Faculty) were the student leaders of this and the coming year of various faculties and the JUSU. Referring two specific killings that took place within the premises of the University of Jaffna before 2009, the slaying of Kuna (Panchadcharam Kunenthiran) who was the former president of Jaffna District Students' Union and the slaying of Purusoththaman who was a student of Jaffna University, the poster warns the students of the same fate. There have been no investigations on the killings of Kuan and Purusoththaman. The dead bodies were taken over by the SL police without allowing the families or relatives to conduct funeral at that time. 25.10.11 Another student activist attacked, civil society comes toget..